Shadow people, also known as shadow figures, shadow beings, or black masses, are dark, human shapes typically seen at night and often viewed out of the corner of your eye. They’re sometimes seen as a simple dark patch. – Many have hats on. – Often wearing an old fashioned cloak. – Are aware of us and react to us seeing them. – Generally male-like, though gender is not obvious. – They can walk through objects/walls. – Silent, they do not try to communicate or speak. – Very tall, not uncommonly 6ft -7 ft (but can also be short). – Have no visible eyes (although occasionally red eyes have been reported). – Their form has a depth, mass, 3-D shape. – Very fast, move with lightning speed. When Shadow people become visible we usually notice a mist or fog that comes into view. The black mass begins to take the shape of a person or animal form but without details of a human form (i.e. without eyes). If the manifestation continues, the shadow person may become a see through apparition. Found lurking in homes, many times in bedrooms. They will stand along the edge of the room or in a doorway and just watch. They do not try to communicate; they appear to just be observing us. Once detected, they will often flee, going through a wall or disappearing around a corner. They usually have a human form often wearing a cloak and hat. These types seem to give us a feeling of fear or dread, although I wonder whether it is just the fear we have from seeing them in the middle of the night and not what they are actually presenting to us. This class of shadow people is known to attach to one individual and have been known to follow them even if they move. This type seems to have their own agenda and is not interested in what we are doing or They typically go from one place to another and do not seem to care that we see them. These are the least understood of the types, as they do not appear to want to interact or observe us. This type seems to be tied to a place or location. Many times there are more than one that are in that particular area. It is believed that these types have a strong emotional tie to the location that they are found at. These we see lurking around haunted locations as well. Shadow people are probably one of the most difficult entities to understand. They are a myriad of beings that exist in our surrounding dimensions, but which ones are ones that have crossed over from another dimension or ones that are earth bound souls? Emotional harmony: positivity, grounding, changing your emotional state. Leave the lights on, as this appears to disrupt the Shadow Peoples energy. My personal experience with Shadow People started when I was a child. I referred to them as the wall or fan people. I was terrified to sleep in my room and often found my way down the stairs to the couch or decided that if I had every part of my body under the covers they would not see me. They would be there most nights usually one to three of them. The ones I saw were a black mass with human shape but no other human characteristics. They did not try to communicate with me nor did they disappear when I observed them. I did feel a sense of fear but could have very well been seeing these beings as a child. Looking back I believe they were attached to my location as when I moved I did not see them again nor did I see them in any other room. Since that time I have had a few more Shadow People experiences, the most recent a few months ago where Missy and I were outside and a mist appeared and took form for several minutes then dissipated. We were not afraid that both actually felt grateful for the experience and even walked closer to see it. When we approached you could feel the energy of it and I had the sense that it was a passed soul coming through to us. It was one of those beautiful moments in life that you get to experience the bridge in dimensions. 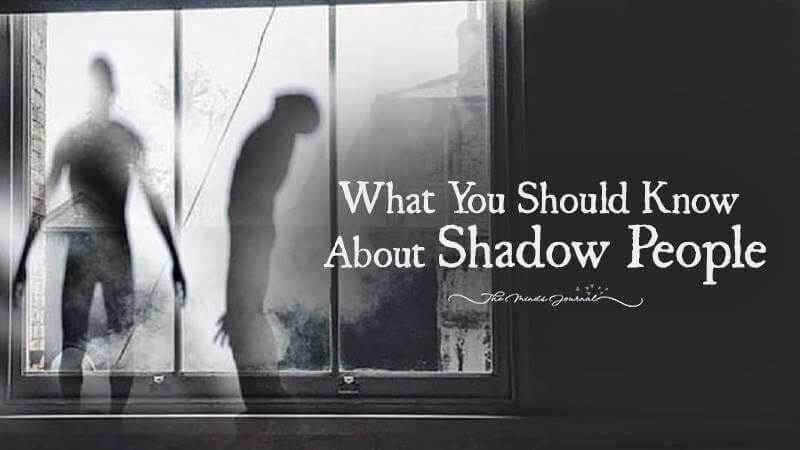 Have you ever had an experience or seen a Shadow Person? Would love to have you comment below if you have.